Philippine Internet Could Get Faster With The National Broadband Plan! Home / internet / news / services / Philippine Internet Could Get Faster With The National Broadband Plan! Six months into the Duterte Administration we've seen changes that may or may not be popular or are gaining ground. One of which is the increase the country's average connection speed (IPv4) to 13.9 MBPS from 8.5 MBPS. The Philippines is now in first place in the Asia Pacific Region. A table was presented in a recent study that the Philippines’ average mobile speed 13.9 Mbps came in the fastest in the Asia Pacific cluster, topping the speeds of Australia (12.8 Mbps), Japan (11.6 Mbps), South Korea (11.2 Mbps), Indonesia (10.9 Mbps), New Zealand (10.8 Mbps), Taiwan (9.4 Mbps), China (8.9 Mbps), Singapore (8.5 Mbps), Hong Kong (6.1 Mbps), Thailand (6.1 Mbps), Sri Lanka (5.4 Mbps), India (3.5 Mbps), and Vietnam (3.4 Mbps). 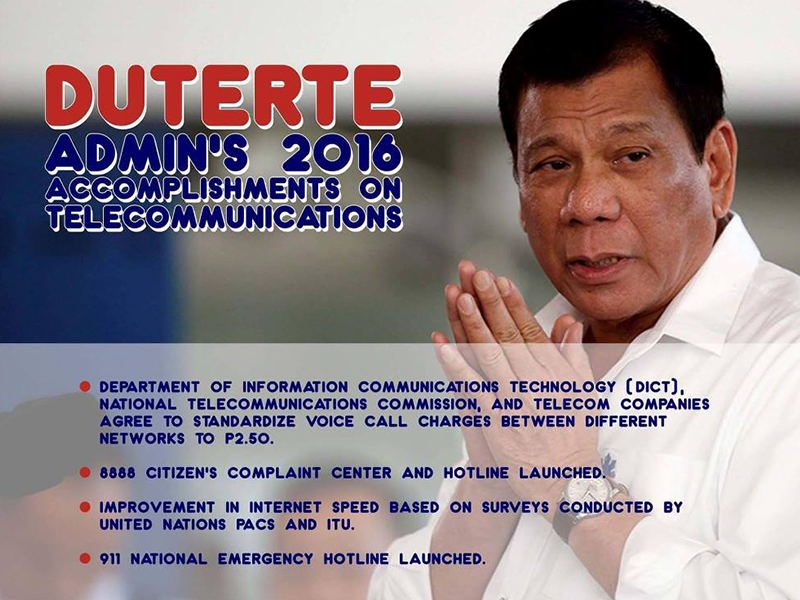 Related: Duterte Approved The National Broadband Program! This is seen to improve even further with the hopeful implementation of the National Broadband plan. National Telecommunications Commission Deputy Commissioner Edgardo Cabarios commented after Akamai, a leading content delivery network services provider for media and software delivery and cloud security solution, noted in its third quarter survey that the Philippines had registered marked improvements in terms of connectivity. There has also been a 5.4 percent increase for the 10 Mbps broadband adoption in the Philippines which represents a 9.1 percent quarter on quarter while on the 15 Mbps broadband adoption category there has been an increase of 2.4 percent or an 11 percent quarter on quarter improvement! This could be all attributed by the recent activation of Smart and Globe of Long Term Evolution cell sites with the 700 MHz spectrum, Cabarios stated. Cabarios added that when the Department of Information and Communication Technology (DICT) has finalized the national broadband plan, it will give a boost to fixed-line internet speed and improve coverage across the country. THIS IS WONDERFUL NEWS! YOUTUBE in 4K and / or 1440P at 60 FPS has been very difficult the past couple of years especially those who need to see videos at those framerates like professional gaming enthusiasts like us at here at www.gizguide.com! What do you guys think? Is this great news? Tell us everything at the comments below!